I'm late actually making this wreath. I wanted something that I could use for both spring and summer. I won't lie, while I love having some decoration on my front door, storing ten different wreaths for every season is just not something I want to do. So I wanted to make something Springy, but not so much that I couldn't carry it through summer. 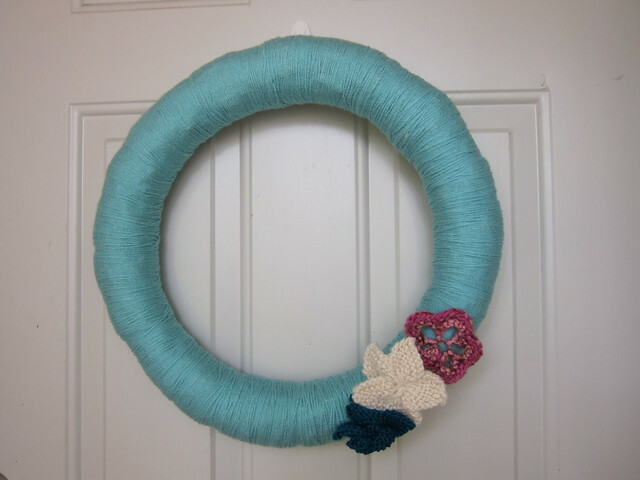 If this is your first yarn wreath you can check out my full tutorial here. You basically just tie on and then spend a good amount of time wrapping. Originally I had planned on doing felt flowers again, but decided to use some scrap yarn I had and knit a few flowers. 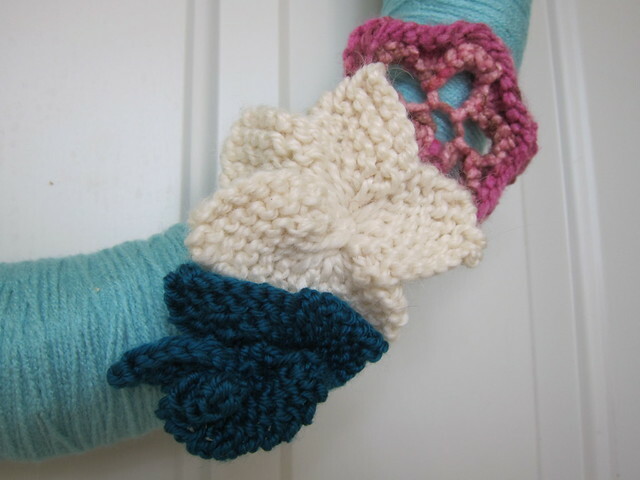 The great thing is that you can use either of these patterns with different sized needles and yarn to create different sized flowers. For the pink flower I used this tutorial. I decided to leave mine open, rather than putting a center piece on mine. Repeat rows 1 - 12, 4 more times for a total of 5 times. Weave yarn in and out through the eyelets, pull tightly and secure. The dark teal one I used the above pattern, but somehow messed it up. I think I miscounted, but was able to roll it up and still use it. I then hot glued all my flowers on and used a bit of ribbon to create something to hang the wreath from. Gorgeous! I love yarn wreaths and loved that you made your flowers to put on it too. Cute! I don't knit, but I think I can handle a yarn wreath. I need a wreath. Our door has a big nail jutting out from it. They're easy to make and you can always use felt for any embellishments. It's just time consuming to wrap it. That's the Best Ball Shot I've Ever Seen!